Everyone’s kung fu fighting! Everyone remember that classic song of yore? It had the campy feel to it, and yet was extremely upbeat in the sense. Well, nothing quite like gets the heart beating fast than with quick kung fu action, where blows are parried and delivered with deadly precision. However, technical knowledge about the martial arts must not only be practiced, but they must be discovered via reading, too. This is why books (or ancient scrolls) are important, and make sure they remain in place with the $19.99 Fighting Stickmen Bookends. 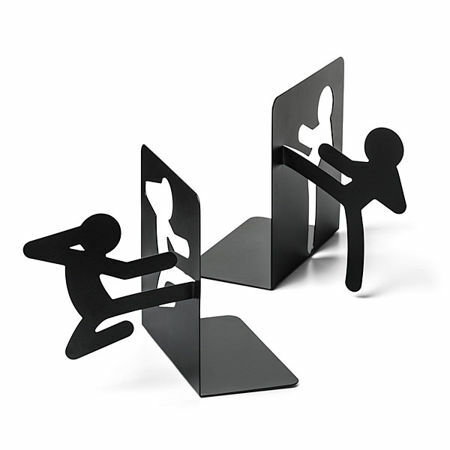 The Fighting Stickmen Bookends would be able to kick your books into place, where the pair of bookends resemble those of stickmen fighting one another, separated by a row of tomes. They are made out of steel in order to ensure that your books do not end up tipping. Literature, take that! Hi—yaaaa!